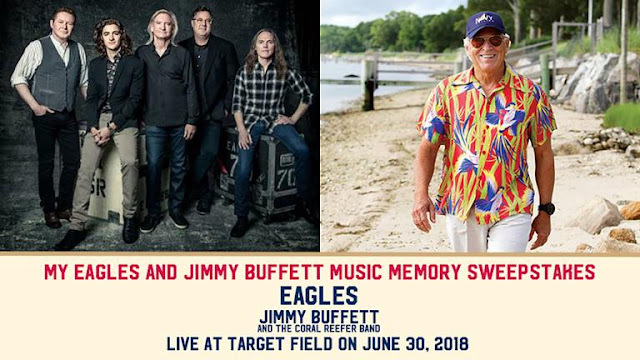 Fans of The Eagles and Jimmy Buffett have a chance to win tickets to the live concert on June 30th at The Minnesota Twins Target Field! The Winner will receive two (2) tickets for the Winner and one (1) guest for the Eagles and Jimmy Buffett and the Coral Reefer Band concert at Target Field, Minneapolis, MN on June 30, 2018 (the "Prize"). Approximate Retail Value of the Prize: $300. NOTE: No transportation or lodging are included with the sweepstakes prize. HINT: It does appear that you can enter once via their Facebook Contest and once via their Twitter contest. Please see both sets of rules for details. This Sweepstakes ends on 12/01/17 and you can ENTER ONCE to win.